My friend was well-meaning, really wanted to help, and was even doing the best he could; but, honestly, he had no business attempting this type of work. Because he was not properly trained, he was putting himself at risk, and potentially doing more harm than good to the people that we were trying to serve. This story is very similar to what I see in many disaster settings, as scores of untrained volunteers converge on the site of a disaster. It is not uncommon for people to show up on site with the best of intentions, but with no real knowledge or training in disaster work. In most disaster sites, there is no food, water, shelter, or fuel to spare for volunteers. People that are not connected with trained and self-sustaining organizations often rob resources from those suffering in the midst of a disaster. Just because you mean well or own some equipment does not mean that you are ready to be serving in a disaster area. Untrained people are much more likely to get injured, hurt, or expose themselves to health hazards, as they are typically unfamiliar with potential risks in a disaster zone. In disaster settings, volunteers will encounter victims, who are often stressed, overwhelmed, desperate, and even angry. Untrained volunteers are often clueless in how to provide appropriate assistance and correct information that can genuinely help those who have suffered loss. 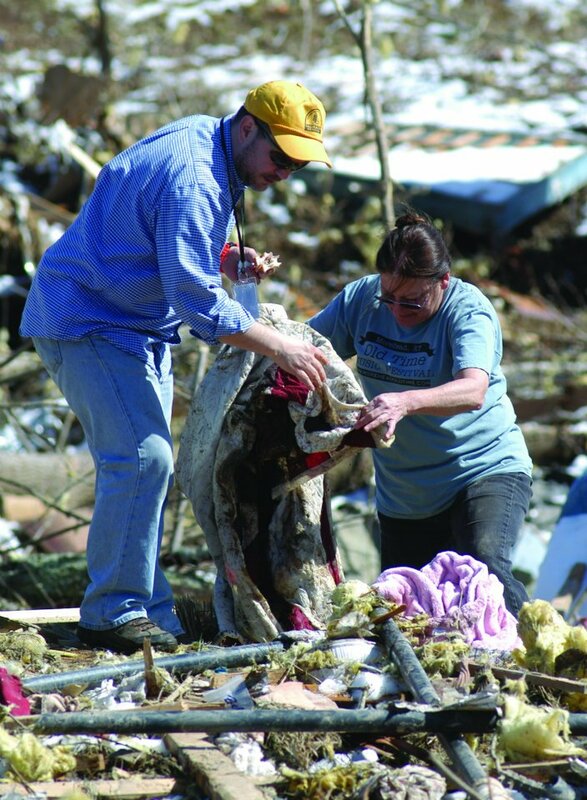 Volunteers in disasters work long, stressful days in austere and rugged living conditions. Showing up unprepared is a good way to create more problems for yourself and others. Spontaneous volunteers typically lack familiarity with situation assessments and incident management; and, because of this, usually end up being in the way, rather than providing meaningful help. Scam artists, who are there to prey on hurting and vulnerable people, often show up in disaster settings under the guise of being a volunteer. To ensure the safety of victims, most disaster groups need volunteers who have been previously trained and who have been screened properly. Disasters are complicated and intense situations that require people with some basic training and real commitment. The priority in times of disaster is providing genuine help to those affected by disaster, not giving spontaneous, untrained volunteers a feel-good moment. For the sake of the hurting, get trained. For Jesus’ sake, get trained. It is back to school this week for students, faculty, and staff all across the Bluegrass even though it seems they just got out for the summer break. 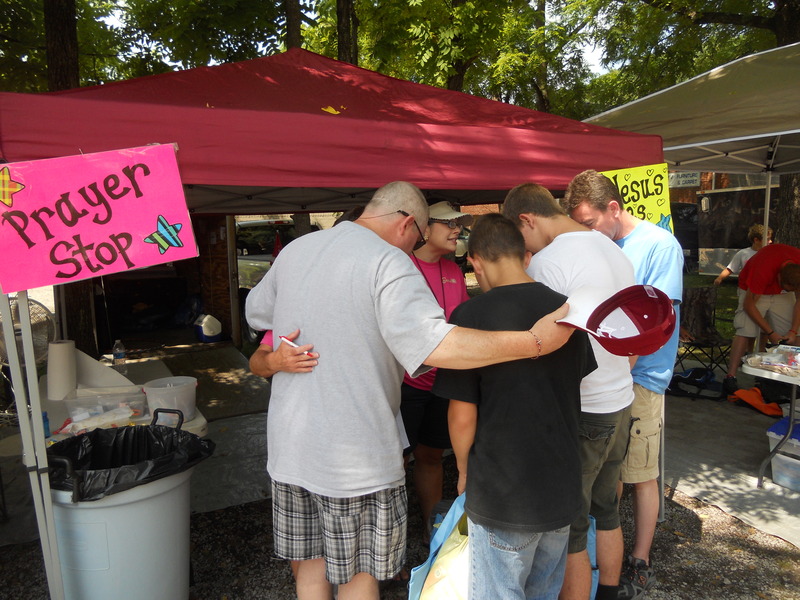 With the beginning of school many Kentucky churches, associations, and ministries held Back-to-School events to provide some fun activities, food, help with much needed school supplies, and to share the Gospel message. Thousands of students were served through these events. One Back-to-School Bash that I visited was at the Freedom Center Ministry in Cumberland (Harlan County), KY. Six mission teams from South Carolina, one team from Alabama, and two teams from Frankfort, KY came to assist with the outreach where over 400 students and families were served. The children were given one new and one used outfit, new socks and underwear, had their feet washed and were given new shoes. They were then prayed with and given school supplies and hygiene items. Some of the girls received manicures and pedicures, while some of the boys received free haircuts. Games, crafts, and food were also available for the students. 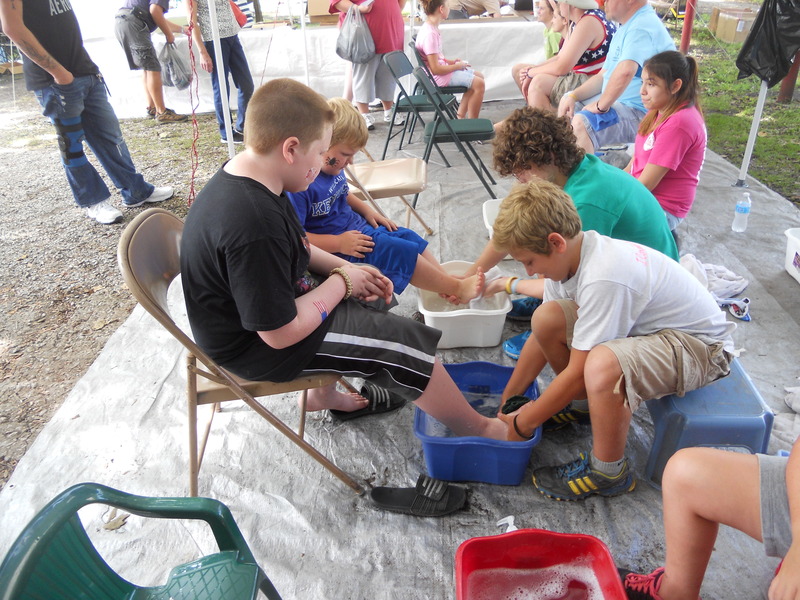 It was such a blessing to hear one of the preteen volunteers share with the children that the reason they were washing their feet was because Jesus had washed the disciples’ feet. He asked each one, “Have you heard that story?” then proceeded to tell them. A future minister or missionary I am thinking. Similar events were held in lots of other locations as well. Many ministries placed a Bible in each of the backpacks. Some of the churches gave gas cards to the college students. A big thank you goes out to all of those who helped the students to begin the 2014-2015 school year. And, a big thank you to those ministries that will provide food backpacks to needy children all throughout the year. Please commit to pray for the students, administration, faculty, and staff. Say special prayers for the bus drivers who, day after day, have those precious lives on such dangerous roads. Pray for students to get involved in Christian organizations such as B.R.E.A.K., First Priority, Fellowship of Christian Athletes, and others. Especially pray for those going away to college for the first time to get connected to a good campus ministry and stay committed to their faith. May this be a fun, safe, and EXCEPTIONAL year!! When it comes to the Great Commission, the lostness of the world is second to the global glory of God. God’s greatest concern, as I wrote last month, is He great glory among the nations. Only when our passion for God’s glory blazes will our endeavors to make Him famous among the nations shine bright. Ironically, instead of blazing a trail for God’s glory in Jerusalem and abroad, the early disciples were first told to wait. Wait? The strategy for which the Lord gave the apostles began with waiting. That seems quite odd for a movement that was intended to take the world by storm. But if you think about it, where does this unquenchable passion for God’s glory among the nations come from? Jesus knew that what the early disciples needed most was power from on high, not power from within. Furthermore, passion for God is ultimately God-given passion. Therefore, Jesus instucts the disicples to wait in Jerusalem for what the Father had promised, namely the gift of the Holy Spirit (Acts 1:4-5). Both the power and passion for accomplishing the Great Commission comes from above; it comes from outside of ourselves. The Holy Spirit would ignite a passion and provide the power to go into all the world preaching the gospel (Acts 1:6-8). Interestingly, after Jesus’ departure, we find the disciples locked up in an upper room . . . waiting. That is, waiting and praying (Acts 1:12-14). Great Commission advancement always invovles waiting and praying. A survey through Acts demonstrates that gospel boldness is closely connected and often follows the fervant prayers of God’s people (e.g., Acts 2:42; 3:1; 4:23-31; 6:6-7; 10:9; 13:1-3). As we examine the book of Acts it’s no wonder why we see such incredible gospel advancement. 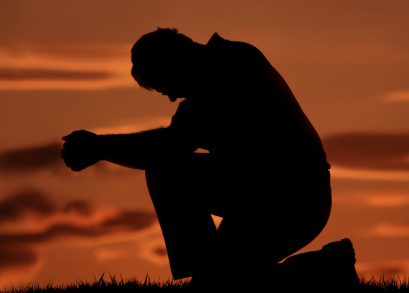 The early church bathed the advancement of the gospel in prayer. Yet, prayer seems to be an afterthought in so many churches today when it comes to Great Commission faithfulness. “The gospel must be on the go,” we say. “We don’t have time to pray when lostness is all around us,” we chide. Yet, the underlying truth that the early church understood, that we would do well to understand, is that the gospel advances supernaturally through the prayers of the people of God. In other words, the battle against lostness is first fought on our knees. We need churches and associations entering the battlefield on their knees before going to their feet. Yes, “beautiful are the feet of those who bring good news of good things” (Rom 10:15). Yet, as we see from Acts, the beauty of our feet comes from calloused knees. Great Commission faithfulness must begin with empowerment thru prayer. Strategies void of prayer will be strategies void of power. Only when God’s people cry out to Him who alone can take a message offensive and foolish to the world and turn into a beautiful embrace of Jesus Christ and Him crucified will that message advance powerfully. Let us be faithful to advance the Great Commission, but let us wait upon calloused knees for God to give us His power and passion.